Description: General Specs: Fox, Year 1923, 16 Gauge, 6lbs, Chokes Cyl/M, LOP 14 1/8", DAH 2 5/8", DAC 1 9/16"
The A.H. Fox C Grade guns are considered by many to be the most attractive of the Fox guns. There are higher grades, but the C Grade engraving is elegant. The 16ga. C Grade is a rare gun, as they only produced 305 C Grade Fox guns in 16ga. and only 202 came from the Philadelphia factory. Anyone who has handled the Fox 16ga. graded guns realize they are all built on the 20-gauge frame and are light and finely balanced double guns that are a delight to carry afield. 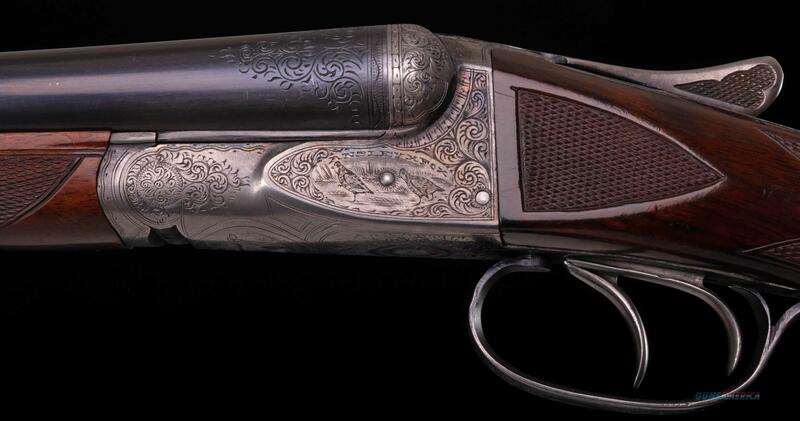 What a great Fox gun for all your upland needs and sporting clays when those vintage shoots come up. The Fox CE 16ga. is highly sought after and the values continue to rise, so don’t let this one get away from you. Thanks for looking! LET ME SELL YOUR GUNS!!! As you can see, I do a thorough job, am nationally known, and have hundreds of existing customers looking for your gun! Federally licensed dealer of Classic American Doubles, i.e. Fox, Parker, Ithaca, L.C. Smith, Lefever. Guns must be shipped to licensed dealer. Layaways accepted. No returns on layaways. I BUY SHOTGUNS, COLLECTIONS OR ONE AT A TIME.